To receive MEPAG announcements via e-mail, please sign-up for the MEPAG e-mail list. Jeff Johnson, MEPAG Chair, was invited with the other AG Chairs to present at the first meeting of the NASA Planetary Science Advisory Committee (February 21-23, 2018). The PAC leadership and Feb 21-23 meeting agenda can be found at: https://science.nasa.gov/researchers/nac/science-advisory-committees/pac. The MEPAG presentation has been posted here. Based on the discussions at the MEPAG July 10 Virtual Meeting (#34), MEPAG made two presentations to the NASEM Committee on the Review of Progress toward Implementing the Decadal Survey Vision and Voyages for Planetary Sciences at their July 13, 2017, meeting. These presentations can be found in the MEPAG Meeting #34 folder and will also be posted on the NASEM website http://sites.nationalacademies.org/SSB/CurrentProjects/SSB_177619. A white paper has been posted to the LPI website, regarding the value of Participating Scientist (PS) programs within NASA’s planetary mission portfolio. The paper, led by LPI Director Louise Prockter and coauthored by representatives of the NASA Analysis and Assessment groups, is based on data collected from surveys of the planetary science community and mission leadership. Overwhelming support was found for PS programs, which provide significant value in increasing intellectual and demographic diversity among mission science teams. The white paper’s authors conclude that greater consistency in timing, funding, and approach could make PS programs even more effective and useful to NASA; as a result they make eight recommendations, including that PS programs should be included on every planetary mission. The Mars Exploration Program issues Requests for Proposals for Critical Data Products designed to assist planning, implementation and operation of future Mars missions. The RFP for the current call (Round X) can be found at https://acquisition.jpl.nasa.gov/rfp/NT-2692-081715/default.htm. Proposals are due Wednesday, October 14, 2015, 3:00 PM (Pacific). DESIRED OUTCOME: Descriptions of the factors related to minimum acceptable quality for the samples that would potentially be the basis of Mars returned sample science, and formulations of potential baseline and threshold sample quality requirements for each factor. WHY: The science community needs to describe the desired and minimum acceptable state of the samples that would be needed to achieve the scientific objectives of MSR. This is a key input into a). requirements formulation for the M-2020 rover, and b). forward planning for the other potential flight and ground elements that would be associated with MSR. The Mars Exploration Program (MEP) would like to solicit your participation on a Mars 2020 Contamination Study Panel. Mars 2020 is a strategic mission sponsored by NASA's Planetary Science Division, through the Mars Exploration Program, all of which are part of the Science Mission Directorate (SMD). This mission is designed to advance the scientific priorities detailed in the National Research Council's Planetary Science Decadal Survey, entitled "Vision and Voyages for Planetary Science in the Decade 2013-2022." Mars 2020 rover development and design will be largely based upon the Mars Science Laboratory architecture that successfully carried the Curiosity rover to the martian surface. Additional mission information can be found at http://mars.jpl.nasa.gov/mars2020/. The Mars 2020 Science Definition Team report http://mepag.nasa.gov/reports/MEP/Mars_2020_SDT_Report_Final.pdf recommended that, among other in-situ science and technology objectives, the mission should acquire scientifically selected samples and place them into a cache that could potentially be returned to Earth by a future mission. These samples, should NASA choose to return them, would provide opportunities for performing a variety of Earth-based experiments including ones related to the search for signs of life. In order to meet the requirement that the cache be returnable, the MEP and the Project must define hardware requirements and mission characteristics that would affect the quality of the samples and future measurement results. One such attribute is the ability to reduce terrestrial organic contamination to a point where its presence would not interfere with sensitive investigations of martian organic geochemistry-or with our ability to distinguish terrestrial from martian organic molecules. It is anticipated that these requirements will place constraints on spacecraft cleanliness (particularly organic cleanliness) and sampling/caching system capabilities, including potentially introducing a requirement for blanks, witness plates, and check material. Evaluate draft Mars 2020 mission sample contamination requirements. Assess implementation approaches with respect to returned sample science objectives to support the investigation of martian organic geochemistry in the returned samples and differentiation of indigenous molecules from terrestrial contamination. The panel will have approximately 5-10 members, plus involvement of program/project/discipline support personnel. It is anticipated that the panel members would have expertise and knowledge spanning astrobiology, organic chemistry/geochemistry including theory and state-of-the-art lab practices, and contamination control and measurement. The panel will meet by teleconference once or twice per week between March 1 and July 1, with two face-to-face meetings. A draft report will be due May 1, and final report July 1. If you are able and interested in supporting this effort, please, send a curriculum vitae and letter of interest to Dr. Michael Meyer via email (mars2020-contam-study@lists.nasa.gov), by February 25, 2014. Thank you for your consideration. The Mars Exploration Program has issued, in January 2014, a Request for Proposal for round IX of the Mars Critical Data Products program. This RFP provides support for initial landing site surface, atmosphere, and gravity characterization for the Mars 2020 rover mission. The intent is to convert mission data and numerical simulations into products focused on specific landing site targets (to be provided by the program) that will be useful for reducing the risk to the Mars 2020 rover mission. Proposals are due on Wednesday, March 5, 2014. Details of the RFPs are posted at: https://acquisition.jpl.nasa.gov/RFP/WH-2691-120313/default.htm or https://acquisition.jpl.nasa.gov/bizops/. The Mars Exploration Program has issued, in August 2013, a Request for Proposal for round VIII of the Mars Critical Data Products program. This RFP provides support of the modeling the dust and particle environment of Comet 2013 A1 (Siding Spring) during its encounter with Mars in October 2014. The intent is to provide data products useful for risk assessment and mitigation strategy development for the Mars orbiter missions, due to possible impacts from dust and ion tail particles as this comet encounters Mars. Proposals are due on Wednesday, September 11, 2013. Details of the RFPs are posted at: https://acquisition.jpl.nasa.gov/RFP/MJ-2692-072413/default.htm or https://acquisition.jpl.nasa.gov/bizops/. This mission will advance the scientific priorities detailed in the National Research Council's Planetary Science Decadal Survey, entitled "Vision and Voyages for Planetary Science in the Decade 2013-2022" (the Decadal Survey is available at http://www.nap.edu). Mars-2020 rover development and design will be largely based upon the Mars Science Laboratory (MSL) architecture that successfully carried the Curiosity rover to the Martian surface on August 6, 2012 (UTC). The 2020 rover is intended to investigate an astrobiologically relevant ancient environment on Mars to decipher its geological processes and history, including the assessment of its past habitability and potential for preservation of biosignatures within accessible geologic materials. The fifth and final landing site workshop for the 2011 Mars Science Laboratory (MSL) mission will be held May 16-18, 2011, at the DoubleTree Hotel in Monrovia, California. All members of the scientific community are encouraged to participate in this important activity. We are soliciting presentations related to the four final candidate sites (Eberswalde crater (23.8953°S, 326.7426°E), Gale crater (4.4868°S, 137.4239°E) Holden crater (26.4007°S, 325.1615°E), and Mawrth Vallis (23.9883°N, 341.0399°E). The final workshop is expected to focus on new science results related to evaluation of the sites, and talks relevant to outstanding issues and questions detailed at the fourth workshop are a priority. (see http://marsoweb.nas.nasa.gov/landingsites/ and http://webgis.wr.usgs.gov/msl/). Overview and summary talks related to the sites are not being sought. Work will lead to fleshing out of a set of testable hypotheses for the rover for eachsite and presentations on specific investigations that accomplish mission objectives are also encouraged. The workshop will include sessions with talks on site characterization and emerging from advance studies by the Project science and engineering teams as well as those submitted to the workshop from the science community. To be considered for an oral presentation (no posters), interested participants should submit a title and short statement of the topic (no more than 2-3 sentences) to both John Grant (grantj@si.edu) and Matt Golombek (mgolombek@jpl.nasa.gov) by April 11, 2011. There will be ample time for open discussion of each of the four sites remaining under consideration. Workshop outputs will include summary charts listing the relative merits and shortcomings of each site relative to MSL mission objectives. In addition, the MSL Project continues to solicit specific targets for exploration by the rover within and outside of each of the final four candidate landing ellipses. Members of the science community are invited to propose science targets and will be asked to provide a short statement on why each target is important and what tools and instruments on MSL would be used in the target interrogation. These targets are being used to help to define the mission resources required to complete the science investigations at each site and are helping to inform integrated traversability and science evaluation studies conducted by the MSL Project, MSL Landing Site Working Group, and the science community. More information on submitting exploration targets can be found at: http://msl.gps.caltech.edu. Input from the science community is critical to identifying the optimal landing site for the MSL. We look forward to your continued involvement! The conference will be held at the Tivoli Lisboa, Lisbon, Portugal, on June 13-15, 2011. The conference will begin after lunch on Monday, June 13, and will run for 2.5 days through the end of the day on Wednesday, June 15. The conference will be immediately followed by the first International Mars Exploration Program Analysis Group meeting (MEPAG #24), June 16-17at the same venue. All participants in the Habitability Conference are strongly encouraged to stay for the MEPAG meeting. Finally, a post-meeting field trip to the important Mars analog site at Rio Tinto, Spain, is planned for June 17-19. The abstract deadline for the International Conference on Exploring Mars Habitability (June 13-15) was originally announced as February 11, 2011, but this has now been extended by 10 days, to Monday, February 21, 2011. For interested members of the community, the conference information, including the abstract submission web site, can be found at the following web site http://www.congrex.nl/11a14/. We hope to see you in beautiful Lisboa in June! The Planetary Science Division is now advertizing for a Mars Program Scientist who will be responsible for overseeing the science content and execution of assigned Mars Exploration Program missions and activities. The position opened November 5, 2010 and will close on November 26, 2010. U.S. citizenship is required. All applications must be received no later than midnight Eastern Time on the closing date of the announcement, and NASA is an Equal Opportunity Employer and Provider. The vitality of our Planetary Science program begins with the best people working at NASA Headquarters, so please take a moment to think about the future of the field and your role in making great things happen for the science community. I encourage you to apply for this fabulous opportunity. The Mars Program Offices at NASA Headquarters and The Jet Propulsion Laboratory invite submission of new candidate landing sites for future missions. The goal is to gather information on future candidate landing sites and develop a list of high priority candidate landing sites for a range of possible future missions so that targeting by instruments on the Mars Reconnaissance Orbiter (MRO) and Mars Odyssey (ODY) can begin while those orbital assets are still in operation. Proposed landing sites require submission of a short abstract (template available at http://marsoweb.nas.nasa.gov/landingsites/ andhttp://webgis.wr.usgs.gov/msl) and can be for a variety of future Mars missions (e.g., Sample Return, Network Science, or other potential missions), but must include specific but brief statements about the type of mission and mission science objectives, location of the candidate landing ellipse and how it addresses the mission science, desired target for initial imaging by MRO and ODY instruments, and basic information related to engineering (elevation and latitude that is supplemented by information regarding rock abundance, thermal inertia, and slopes where available). Preliminary science goals for Sample Return and MAX-C can be found at http://mepag.jpl.nasa.gov/reports/index.html. Candidate sites for MSL are excluded from consideration as there is a separate call for sites for that mission. An ellipse size of 15 km will be assumed for missions using MSL heritage landing systems, such as sample return or the MAX-C rover being considered for 2018. Missions using other landing systems must include an ellipse based on expectations from mission concept studies. New candidate landing sites can be submitted through the end of 2009 and should be submitted via e-mail to both John Grant (grantj@si.edu) and Matt Golombek (mgolombek@jpl.nasa.gov). Individuals are limited to proposal of 3 sites/specific ellipses and are responsible for including a summary review of existing MRO and other data for their candidate sites. After review and prioritization by the landing site steering committee, a list of up to 100 candidate sites will be provided to the MRO, ODY, and Mars Express teams for imaging during the first year. Data will be made available to proposers as soon as images/data products are available. It is anticipated that a dedicated landing site workshop will be held late in 2010 or early in 2011 to enable discussion of new candidate sites and it is likely that those sites deemed of the highest merit will be selected for additional imaging. This call for candidate new landing sites is an unfunded effort. It is anticipated that a call for proposals (RFP) to support analysis of new candidate landing sites will be issued by Critical Data Products (CDP) Program at JPL in January 2010. It is expected that CDP will fund approximately 5-10 proposals at 25K for one year in early 2010 with additional funding anticipated for additional sites in future years. Report on MEPAG's meeting of July 29-30 at Brown University in Providence RI. Attendance at the meeting was about 110 in person, including representatives from academia, multiple NASA centers, NASA-HQ, government, contractors, the press, and several international scientist including representatives of foreign space agencies (ESA, CSA). The ESMD Implementation Plan communicates our approach for achieving the Agency’s ambitious exploration goals. In addition, it provides NASA employees, external partners, and stakeholders with an overall understanding of the ESMD mission, goals, objectives, and priorities across the organization. This is the first of what will be a regular series of newsletters to the community regarding the 2009-2011 Planetary Science Decadal Survey. We all get too much email, so I'll try to keep these concise! 1) The decadal survey will establish the priorities for planetary exploration in the U.S. for the coming decade. 2) The process is just getting started, and will take place over the next two years. 3) The goal is to formulate a plan for planetary exploration that truly represents the consensus view of the science community. 4) Community input to the decadal survey via participation in Town Hall meetings and generation of written white papers is strongly encouraged and in fact is necessary for the success of the survey. White papers should be submitted no later than September of this year. As most of you know, the Planetary Science Decadal Survey is organized by the National Research Council at the request of NASA and NSF. Its objective is to set clear priorities for solar system exploration for the coming decade. Congress and the Office of Management and Budget highly value the decadal survey process for establishing the science priorities in various NASA fields. The astronomy and astrophysics decadal survey is also now underway, and the political leadership -- i.e., the people who control the funding-- are familiar with this process and want it to be used for solar system exploration as well. The distinguishing characteristic of the decadal survey process is that it is based on broad input from the science community. The goal is to establish a true community consensus regarding the key science questions for the next decade, and the suite of missions that should address them. To describe NASA's view of the decadal survey, I've asked Jim Green, the Director of NASA's Planetary Science Division, and Doug McCuistion, the Director of the Mars Exploration Program, to write a few words. We are at the beginning of the development of the Planetary Science Decadal Survey that will chart our course for the next 10 years. If you are asked to be on one of the survey panels, I encourage you to accept. If you are not on a panel, please check the schedule for when and where the panel you are interested in will meet and plan to attend and participate. What makes the decadal a powerful document is the strong science focus and commitment by the community to follow it. It is the guide we use at NASA Headquarters, the current Administration and Congress. It is that important! This decadal survey may be the most important one in decades for Mars exploration. I hope each of you will consider how to assist, advise and support the decadal team to create a successful and implementable approach to continue Mars scientific discovery. Jump in, take the opportunity to participate when asked, or volunteer. These proceedings will shape your Mars Program for at least the next 10 years, and I hope you will all engage to the fullest extent possible! As Jim and Doug's comments make clear, the decadal survey is the process by which NASA's goals for exploring the solar system will be established for the coming decade. The process will start from the science, summarizing the current state of knowledge in planetary science and identifying the key outstanding science questions. We will then address what mix of mission sizes (e.g., Discovery, New Frontiers, Flagship) would best address those questions, and generate a prioritized list of New Frontiers and Flagship missions for the coming decade. Missions to Mars and the Moon will be considered on an equal basis with all others. We will also consider a range of other topics, including NSF-funded infrastructure for planetary science, research and analysis activities, and technology development. This decadal survey will differ from previous ones in that much greater emphasis will be placed on evaluating the technical maturity and probable costs of candidate missions. The goal is to produce a clearly prioritized list of missions that can be flown in the coming decade within the available budget. We will strive to avoid creating an oversubscribed plan! Inner planets (Mercury, Venus, the Moon), Mars, Outer planets (including magnetospheres and rings), Outer planet satellites, Primitive bodies (asteroids, comets, Kuiper Belt objects). Each panel will have a chair and a vice-chair; the panel vice-chairs will all serve on the steering committee. Total membership of the steering committee will be about 15, and total membership of each panel will be about 11. This panel structure was arrived at after considerable thought, and consideration of a number of alternatives. Strong practical considerations regarding budget, schedule and logistics dictate that the number of panels be minimized. In the end, it was decided to use a panel structure that mimicked the one used for the last decadal survey. This has the considerable advantage of allowing each panel to use the work done by the equivalent panel from last time as a starting point. The primary difference from last time is that ten years ago astrobiology was segregated from the rest of the survey in a sixth panel. This time, astrobiology will be fully integrated into the five-panel structure, with astrobiologists as appropriate on each of the panels. Over the next couple of months, membership for the steering committee and panels will be established. This is a careful process, conducted by the NRC and aimed at establishing a distinguished membership with the appropriate balance among scientific disciplines, institutional affiliations, gender, and so forth. The panels will do most of their work in the second half of 2009. 2010 will be devoted to studying and costing mission concepts, establishing priorities, and writing the report. The final report will be released in the first quarter of 2011. The primary job of all the decadal survey groups will be to actively engage the entire US planetary science community in the process. We will do this via a variety of mechanisms. We will hold a number of Town Hall meetings at major science conferences, at community gatherings like meetings of the standing Analysis Groups (LEAG, VEXAG, MEPAG, OPAG), in conjunction with panel and steering committee meetings, and in other settings. Your participation in these sessions is strongly encouraged. We will also solicit white papers from the community. These written inputs are a key part of the survey process, and white papers on any topic of relevance to the survey are strongly encouraged. A good white paper should be very concise, with strongly-reasoned arguments. Because the goal of the decadal survey is to build community consensus, it will be particularly effective for white papers to have many co-authors. We need to receive white papers no later than September of this year, so a good time to get started writing them is now. Finally, we will try to make the activities of the steering committee and panels as transparent to the community as possible. For example, we hope to conduct live webcasts of the open sessions of all steering committee and panel meetings. This web site includes the formal statement of task for the decadal survey, a presentation about the survey that I recently gave at the Lunar and Planetary Science Conference, and instructions for how to volunteer. We will soon add a "Frequently Asked Questions" section and information about how to submit white papers to the site. The Planetary Science Decadal Survey is the process by which the US program of solar system exploration for the coming decade will be established. Its effectiveness is derived directly from the broad community participation that characterizes it. I look forward to working with all of you in the months ahead. "Not only are our thrusters off and we are dropping in altitude, we are plunging toward Mars," said Dawn project’s chief engineer from the Jet Propulsion Laboratory. "And everybody here on Dawn could not be happier." The team's joy at plummeting towards a planet named for the Roman god of war is not unfounded. Mars, the final stop for many a NASA spacecraft, was always an important, and weighty, waypoint for the Dawn mission. It all has to do with one of the heavy subjects of rocket science, gravity assists. Launched in September of 2007, and propelled by any one of a trio of hyper-efficient ion engines, NASA's Dawn spacecraft passed the orbit of Mars last summer. At that time, the asteroid belt (where Dawn's two targets, asteroid Vesta and the dwarf planet Ceres reside), had never been closer. In early July the spacecraft began to lose altitude, falling back towards the inner solar system. Then on October 31, 2008, after 270 days of almost continuous thrusting, the ion drive turned off. "Not only are our thrusters off and we are dropping in altitude, we are plunging toward Mars," said Marc Rayman, the Dawn project’s chief engineer from NASA’s Jet Propulsion Laboratory in Pasadena, Calif. "And everybody here on Dawn could not be happier." The team's joy at plummeting towards a planet named for the Roman god of war is not unfounded. Mars, the final stop for many a NASA spacecraft, was always an important, and weighty, waypoint for the Dawn mission. It all has to do with one of the heavy subjects of rocket science, gravity assists. A gravity assist is the use of the relative movement and gravity of a planet or other celestial body to alter the path and speed of a spacecraft, typically in order to save fuel, time and expense. A spacecraft traveling to an outer planet (or in this case asteroid) will decelerate because the incessant tug of the sun's gravity slows it down. By flying a spacecraft close by a large planet and its large gravity field, some of the planet's speed as it orbits the sun is transferred to the spacecraft. In Dawn's case, it is using the Red Planet's tremendous angular momentum (the speed at which Mars orbits the sun) to give it a little extra oomph. "A big oomph actually," said Rayman. "The gravity of Mars will change Dawn's path about the sun, enlarging its elliptical orbit and sending the probe farther from the sun. It will also change Dawn’s orbital plane by more than 5 degrees. This is important because Dawn has to maneuver into the same plane in which Vesta orbits the sun." If Dawn had to perform these orbital adjustments on its own with no Mars gravitational deflection, it would have required the spacecraft to fire up its engines and change velocity by more than 5,800 miles per hour (9,330 kilometers per second). Such velocity changes would have required Dawn to carry an extra 230 pounds (104 kilograms) of xenon fuel. "Without the gravity assist, our mission would not have been affordable, even with the extraordinary capability of the ion propulsion system," said Rayman. "That's why we are happy Dawn is now plunging toward Mars." Also happy for the opportunity to fly past the fourth rock from the sun is Dawn's science team. With asteroid Vesta still more than two-and-a-half years away, Mars provides the perfect opportunity to give their highly-tuned instruments a workout. But the Mars gravity assist is not the final hurdle on Dawn's road to the asteroid belt. The subsequent 30 months include more than 27 months of blue-green tinged ion thrusting to successfully rendezvous with Dawn's first target --Vesta. While an accurately flown encounter with the planet Mars makes a big difference in the life of NASA's asteroid pioneer, the planet itself does not come out unscathed. Weighing in at all of 2,500 pounds (1,134 kilograms), Dawn has its own mass and thereby its own gravitational field. In contrast, the somewhat more massive planet is almost 600 million-million-million times more substantial than that of the spacecraft. Dawn's 4.8-billion-kilometer (3-billion-mile) odyssey includes orbiting asteroid Vesta in 2011 and the dwarf planet Ceres in 2015. These two giants of the asteroid belt have been witness to much of our solar system's history. By using Dawn's instruments to study both objects for several months, scientists can more accurately compare and contrast the two. Dawn's science instrument suite will measure geology, elemental and mineral composition, shape, surface topography, geomorphology and tectonic history, and will also seek water-bearing minerals. 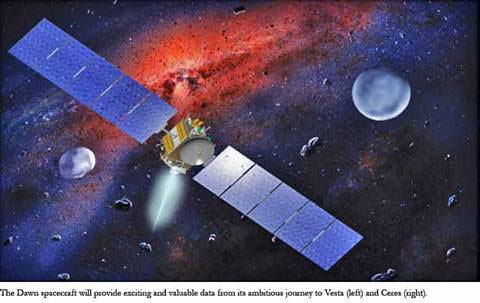 In addition, the Dawn spacecraft’s orbit characteristics around Vesta and Ceres will be used to measure the celestial bodies' masses and gravity fields. The two year delay in the launch of the Mars Science Laboratory (MSL) provides the opportunity for additional analysis of the proposed landing sites remaining under consideration. We now anticipate a schedule that includes a fourth community landing site workshop in the early fall of 2009 followed by a fifth community workshop sometime in late 2010 or early 2011. The fourth workshop will include detailed discussion of the science of the four proposed sites as related to MSL mission objectives and will include presentation of the physical characteristics of the sites. The fifth workshop will emphasize the science relative to the refined landing and roving capabilities of the MSL rover. The dates and venues for these workshops and other activities supporting the MSL landing site selection process are TBD, but we wanted to take this opportunity to make you aware that activities are ongoing and that there will be every attempt made to include the science community in further evaluation of the final four sites. We are contemplating a process to respond to any new discoveries that suggest a new, compelling site. The process for inclusion of an additional site is still being defined, but will likely include the requirement that proposed site attributes be verified in advance via detailed review and/or peer-reviewed publication. We will do our best to keep you informed and involved as site selection activities move forward and we thank you for your continued involvement in these activities! On November 5, 2008, representatives of the MSL project management, engineering, and science teams met along with members of the external MSL landing site steering committee and selected review board members to discuss the engineering assessment of landing safety, basic traversability, and the current status of predicted actuator thermal performance, in order to combine this information with the science rankings from the 3rd Community Workshop recommended to the PSG. Based on assessment over the past months, the project resources and timeline allow only 3 or 4 sites to have the full data acquisition and detailed analyses required for final approval by next spring. A block of rooms at a discounted rate is being held at the Doubletree until August 1st, 2008 and a limited number of travel grants are available to support students (see below). The workshop precedes the MEPAG meeting (starting on Thursday, 9/18) also to be held in the Pasadena area. We are soliciting presentations for the third workshop and invite you to submit a suggested presentation title for consideration on any of the 7 sites being considered for MSL before August 11th, 2008. We urge advocates for individual sites to identify additional presentations/presenters on topics relevant to the sites that may fall outside of their areas of expertise. Pending review of presentations submitted by the broader community, additional talks on topics related to some sites may be added by the workshop program committee. Our goal is to provide as comprehensive a discussion as possible of each site. The bulk of the third workshop will be devoted to discussion of the 7 remaining sites with respect to scientific questions and criteria relevant to the MSL mission. These discussion points and criteria are posted on the MSL Landing Site websites: (http://marsoweb.nas.nasa.gov/landingsites/ and http://webgis.wr.usgs.gov/msl) and should form the outline for science presentations made at the third workshop. The workshop will also include presentations on the physical attributes and surface characteristics of the sites as well as presentations on scientific themes related to the MSL science objectives. There will be ample time for discussion of the sites. The goal of the third workshop will be to produce a summary of the characteristics, strengths, and weaknesses of each of the remaining sites relative to the questions included in the discussion points/criteria document. Thanks to the folks at MSSS (MOC), THEMIS (ASU and Hawaii), HiRISE (U of A), and HRSC (The Free University of Berlin) who have made these data available to the community in support of landing site activities. All members of the scientific community are encouraged to participate in this important activity. Input from the science community is critical to identification of optimal landing sites for the MSL. We look forward to your continued involvement in these activities! The workshop will be held at the DoubleTree Hotel in Monrovia, California, in the Pasadena area (924 W. Huntington Drive, 1-626-357-1900). A group rate of $118/night is available for Sunday, September 14 through the end of the MEPAG meeting following the workshop. Please reference "(MSL) Mars Science Laboratory Landing Site" and make your reservations before August 1. Other hotels are located in the vicinity if the special rate is sold out. Two new student opportunities have been posted in the Student Opportunities section of the MEPAG web site. These cover the 2008 NASA Planetary Volcanology Workshop and the 3rd MSL Landing Site Workshop. This has been an exciting and productive week for the Mars Exploration Program. On Thursday, April 26th, at the Berlin Airshow, NASA and ESA signed Statement of Intent (SOI) to jointly develop a Mars Sample Return plan to be submitted to their respective authorities by the end of 2019. Those authorities, the United States Congress via President's Budget Request and the ESA Ministerial Council via their December 2019 meeting, would be expected to act upon this request in ~18 months. This signing is historic, as it signals the desire, the readiness, and the willingness to work together to execute this inspiring mission, one that many of you have worked towards for many decades. It is the product of more than a year of hard work between the partners. I firmly believe that we, as a community and a team, are ready to tackle this grand challenge. We have the scientific and operational maturity to identify the right samples, the critical technologies are ready to be applied, and with discipline this campaign can be executed affordably. I am excited about this opportunity and ask everyone to join me in making the effort successful. In preparing for the evaluation of Mars Scout Concept Study Reports for the final selection, NASA identified an organizational conflict of interest. NASA determined action had to be taken to resolve the conflict in order to maintain a fair competition. Among several actions deemed necessary to address the conflict, the most significant is that NASA will reconstitute the evaluation team with new members, thereby eliminating the organizational conflict of interest. In order to minimize the impact to the teams’ proposed mission schedules, NASA will expedite the reconstitution and evaluation processes. However, this action will delay the evaluation and announcement of the selection of the next Mars Scout mission by a few months. The teams will be notified when the new schedule is final. Preparation of the most scientifically compelling samples for possible future analysis on Earth necessitates careful inputs and community engagement, and to this end, the Mars 2020 project will create a board of scientists drawn from the diverse array of disciplines likely to be involved in the study of returned samples. Members of the Mars 2020 RSS Board will provide the Mars 2020 Project with scientific assistance and advice through mission development (i.e., through Phase D). The Returned Sample Science (RSS) Board will consist of ~10 team members who will either be chosen via this solicitation, or be appointed as ex officio members. All will be selected for deep knowledge and interest in scientific areas relevant to the study of samples returned from Mars, including planetary protection and curation. The RSS Board will represent the interests of future scientists who may conduct investigations on cached samples collected by Mars 2020. The number and diversity of the RSS team members selected will depend on the character of the applicant pool. The management of the Mars 2020 mission will take place at JPL, but Board members need not be resident at JPL. However, with this solicitation we are also seeking a single board member (Board Coordinator) who will be employed at JPL to participate in the development process for the Mars 2020 mission with specific attention to RSS issues. The Coordinator will work within the Mars 2020 project to identify key issues of relevance to RSS, and will interface with the rest of the RSS Board to seek an RSS recommendation on these issues. In addition, one RSS Board member will be the Chair, to represent the scientific leadership of the Board. Participate in the formulation of expert positions on key Mars 2020 design and implementation issues of relevance to RSS brought to his/her attention. Participate in RSS Board meetings (assume for planning purposes, one/year). Participate if possible in events relevant to the Mars 2020 mission, such as landing site workshops and scientific conferences that bear on returned sample science objectives and/or implementation. Provide advice to the Mars 2020 Project Science office in the development of the requirements (Level 2/3/4) for the sample acquisition, encapsulation, and caching system related to science, planetary protection, or curation. These are all subsystems of central importance to RSS. Provide expert input to project-external studies related to the Mars 2020 mission, if called upon, for example in the area of planetary protection or requirements for follow-on missions that may retrieve the cache prepared by Mars 2020. Provide technical data/analyses related to potential future RSS investigations as needed to inform project decision-making. Contribute as needed to formal project-level science planning documents. If requested, help generate documentation that may be needed by future returned sample science analysts and planners. Participate in mission, spacecraft, and ground system design, integration and test as needed. As described above, a single Board member will hold the position of Coordinator and a single Board member will hold the position of Chair. Application for membership in the Mars 2020 RSS Board will be in the form of a Letter of Application, accompanied by a current CV. RSS Board members will be selected by NASA Headquarters senior officials from the pool of respondents and other qualified candidates. The selected members will have demonstrated expertise and knowledge in areas highly relevant to scientific goals as they relate to the collection of samples that may be returned to Earth in the future. The Letter of Application should summarize the candidate's demonstrated expertise in a scientific discipline of relevance to the potential future investigation of returned samples. The CV should summarize professional assignments and responsibilities, as well as peer-reviewed publications, sufficient to establish the candidate’s position of scientific leadership in the community. Membership in the RSS Board will be determined by NASA after formal review of the applications. Letters of Application are invited only from individuals; group applications will not be considered. In addition, collaborations and teams will not be considered. Each Letter of Application is limited to two pages, with 11-point font with 1-inch margins. Letters of Application submitted by E-mail are preferred, but may also be submitted by regular mail. Responses to this invitation should be received by the Mars Program Lead Scientist no later than July 15, 2015, at the address below. The issuance of this Call for Letters of Application does not obligate NASA to accept any of the applications. Any costs incurred by an applicant in preparing a submission in response to this Call are the responsibility of the applicant. Participation in the Mars 2020 Science Team RSS Board is open to all qualified and interested individuals. Candidates interested in the RSS Board Coordinator or Board Chair position should explicitly state such an interest in their applications. We are very happy to announce that MARDI and ChemCam's cost issues have been solved and both instruments are going forward to launch on MSL. Malin Space Science Systems has agreed that there will be no additional costs to NASA for the completion of the Mars Descent Imager (MARDI). Furthermore, funds returned to the Mars Exploration Program from the unfortunate elimination of MARDI operations on Phoenix will be used to support MARDI integration on MSL. In the case of ChemCam, LANL, the French Space Agency (CNES), and even other MSL instrument team members have developed a series of descopes and support arrangements to allow instrument completion, reducing the development cost-to-go by a little over 80%--i.e., from $2.5M to about $400K. As a result, ChemCam will be funded another $400K by the Mars Exploration Program, allowing them to complete development. This outcome is even better than we had imagined possible in September, when MARDI was descoped and ChemCam was cost capped to save money so that MSL itself could complete development without raiding other missions or R&A. We thank MSSS, LANL, and JPL for their diligence and hard work in finding solutions to these payload issues. We also thank the community for their support of the Mars Exploration Program, the MSL mission, and for the concept of containing costs on one mission so as not to jeopardize others. The support of the NAC in commending our cost control efforts in SMD is also very much appreciated. MSL's launch is now just 21 months away! Though there remain many challenges ahead, the mission remains as exciting as ever, and we can celebrate that that highly anticipated return will not come at the expense of other SMD projects or R&A grants. Sincerely, Alan Stern and Jim Green. In early June 2007, the Mars Science Laboratory project completed its project-wide Critical Design Review (CDR), which marks the completion of the project's design phase and transition into the build up of flight hardware. A key component of the CDR process was a technical risk, programmatic, and cost review, from which multiple independent cost assessments predicted that this technically challenging $1.7B planetary science rover mission's current content would cause it to exceed its budgeted development costs to launch by approximately $75M. Scheduled to launch in the fall of 2009, Mars Science Laboratory is the next step of NASA's Mars Exploration Program, a long-term effort of robotic exploration of the red planet. Mars Science Laboratory is a rover that will assess a variety of scientific objectives, including whether Mars ever was, or is still today, an environment able to support microbial life. The rover will carry the biggest, most advanced suite of instruments for scientific studies ever sent to the Martian surface. Dozens of samples of Mars soil and rocks as the rover makes its travels will be analyzed by MSL to detect chemical building blocks of life as well as what the Martian environment was like in the past. 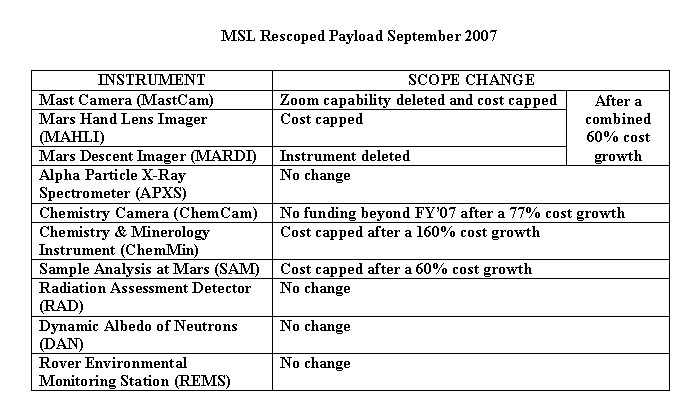 Because the success of MSL is of course of high importance to NASA's Science Mission Directorate (SMD), SMD, working with the MSL Project and Mars Program at JPL, concluded that the MSL project required some focused and prudent reductions in scope in order to better ensure project success. Furthermore, because all of the funds MSL requested were not available in the Mars Exploration Program reserves pool, and because SMD did not want to impact other current or future science missions to fund these new costs, the Science Mission Directorate at NASA Headquarters has been working closely with the MSL project and the science community to identify mission scope reductions to minimize the project's need for funds, while minimizing both technical risk and impacts to the mission's science return. As a result of this careful process, a combination of low-impact mission scope reductions and some new funding from the Mars Program's reserves pool, has been agreed upon. Together these measures effectively resolve the MSL cost increase issues identified at its CDR. Engineering changes to the mission include some reductions in design complexity, reductions in planned spares, some simplifications of flight software, and some ground test program changes. These changes were selected largely to help reduce mission risks. Changes in mission science content were limited to removal of the Mars Descent Imager (MARDI), the MASTCAM zoom capability from the mission, and a change from a rock grinding tool to a rock brushing tool. As noted by the science input NASA received, most of MARDI's capability can be provided by the Mars Reconnaissance Orbiter's HiRise camera now in orbit and working successfully. Furthermore, NASA has directed that the project expend no additional funds on ChemCam, and cost-cap SAM and CheMin at their current budgets. Future budget requests for these instruments cannot be funded. However none of the roving instruments were removed from the payload, and the science team also remains entirely intact. "I am very pleased that we were able to resolve this challenge to the Mars Program without delaying or canceling any other mission in the Mars Program or other parts of SMD, and we avoided impacting Research and Analysis. We were also able to reduce some risks in MSL's development and flight." said Dr. Alan Stern, NASA's Associate Administrator for Science. "The MSL project, Mars Program, JPL and NASA HQ worked together to constrain the impacts to the Mars Program and keep MSL on schedule for its launch in 2009, and we all feel we succeeded." added Doug McCuistion, Mars Program Director.